As a copywriter, I help businesses communicate their brand identity a lot in my day-to-day work – whether it’s through writing website copy, blogs, press releases or any other content. However, it’s often much easier to spot someone else’s brand identity than it is to define your own. Indeed, what we think we’re conveying to our customers and the various people we meet as we go about our work, can be totally different from how they actually perceive us. It’s an area which I know is incredibly important to get right in any business and something which needs constant maintenance. 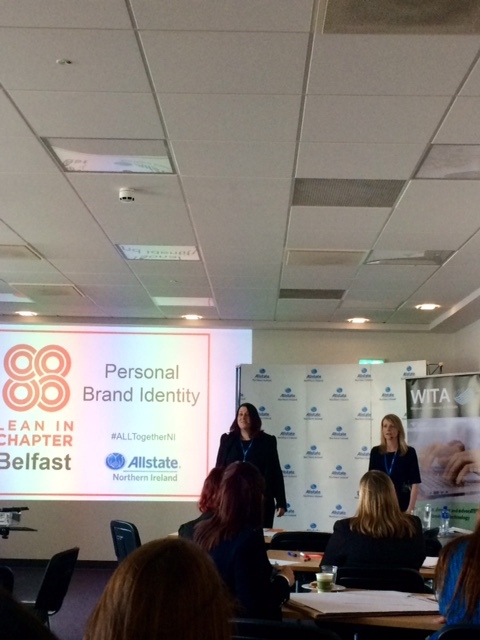 So, when I saw that Lean In Belfast was running an event about personal brand identity at Allstate NI this week, I decided to go along. Lean In Belfast was set up two years ago by president/founder and regional leader, Nuala Murphy, with the aim of supporting both men and women in their careers. Events are subsequently held on the last Thursday of every month, while the group is also very active online, with various other activities taking place throughout the year. 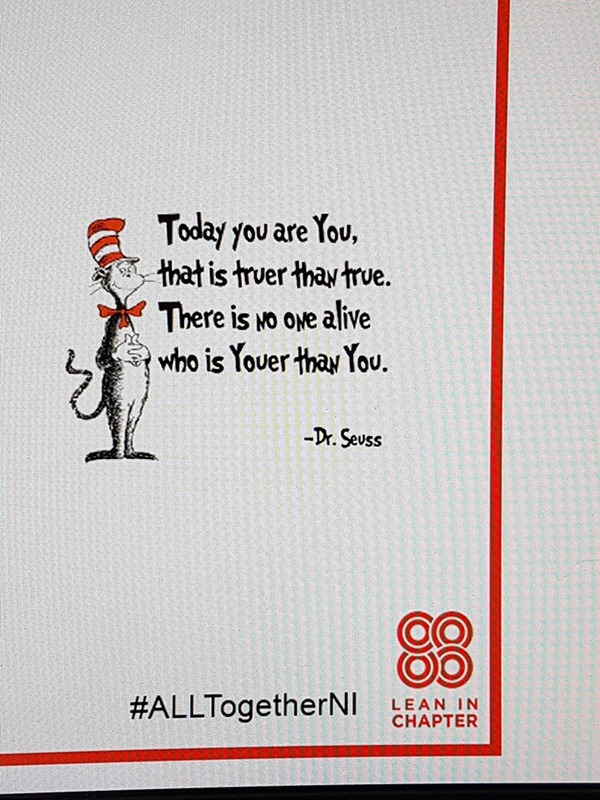 Just what is your personal brand identity? How do you go about identifying it? Why do you need to know it? And how does knowing it help you in your career? All of these questions and more were on the agenda and, as a fully booked-out event, it seemed that everyone was keen to know more. She added that most major brands have cultivated their identities using personal characteristics. Indeed, we attach adjectives like ‘energetic’, ‘fun’, ‘professional’, ‘powerful’ and the like to these brands. Personal characteristics personalise brands and are a powerful way of engaging with audiences. It makes brands more relatable and helps them appear authentic, so understanding your own brand is therefore incredibly important. Everyone has a personal brand, whether they realise it or not. The key is knowing what that is and communicating it effectively so you make the impression you want to make on others. So, what makes a great personal brand? With lots of food for thought already, a bit of group brainstorming followed, where attendees were encouraged to discuss the personal brand identities of some celebrities. What were these identities and were they good/bad? Also, why was that? Just what makes a great personal brand? The conclusion was that creating a great personal brand involves inputting various key elements to ensure the desired output. – Being aware of what you want people to think about you – what do you want them to know you’re great at? By having this self-awareness, a positive personal brand identity which has the desired effect on the people you come into contact with can ultimately be crafted. That is, the look, sound, behaviour, feel and message of your brand should encapsulate all of the things that you want to get across, presenting the image you wish to present to the public. Basically, this is a useful tool which can help you become more self-aware and therefore develop your personal brand. Getting feedback from others is all part of this, we were told, as well as taking the time to look inwardly and assess how you present yourself to the world. Does how you look, how you behave on and offline; how you talk about your brand actually relate to how you want it to be seen? 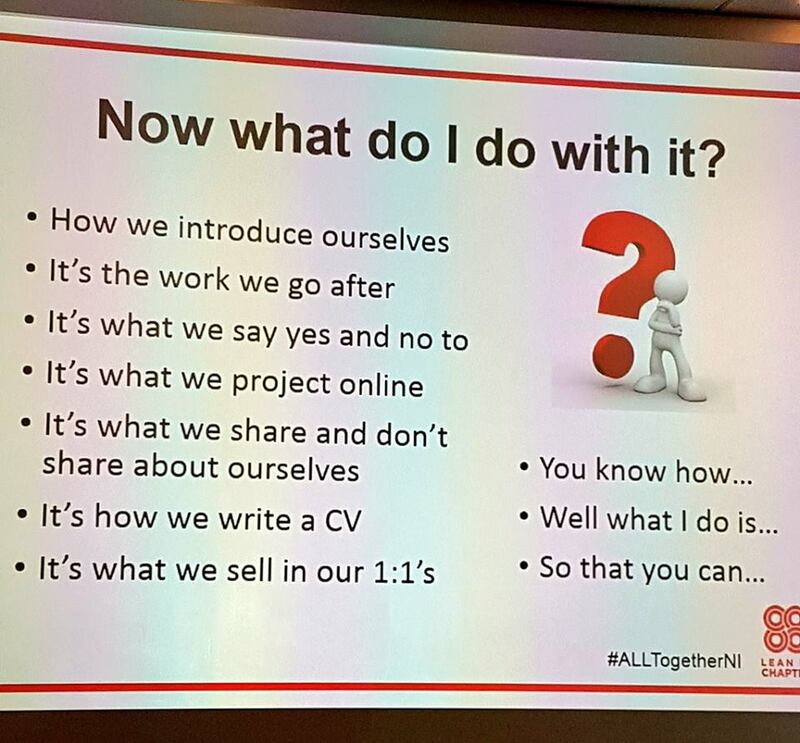 – How do you introduce yourself at networking events, or in general? – What work do you pursue and does this work reflect what you want your business/brand to be known for? – What will you start doing as a result of today’s session? – What will you stop doing? – Ask for feedback about your personal brand – you just might be surprised about how others perceive you. – Become more self-aware – know what you’re good at and focus on projecting your strengths to others to create the brand identity you want. – Confidently communicating about your brand is a learned behaviour and the best way to start is to look inwardly and understand what it is you actually want to communicate. – Personal brands are the key to career success but require constant evaluation, nurturing and maintenance over time as we grow and change over the years. Visit the Lean In Belfast Facebook page here to view videos/more feedback from the day, recorded by Lean In Belfast’s social media director, Louise Brogan, of Social Bee NI.